The OVLWM is available in nominal lengths up to 8’-0” sections or in continuous rows, T5 or T8 operation. The durable extruded housing may be painted any color upon request. White is standard. 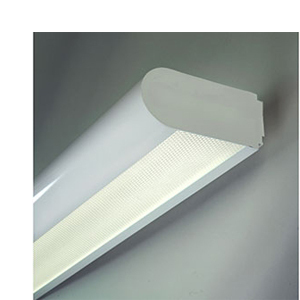 Glare-free direct/indirect illuminations ideal for hallways and small offices. 90 degree turns are available so there are no awkward aesthetic gaps on the wall. Optional clear dust cover keeps lamps clean, thereby improving maintained performance. This wall mount fixture compliments our OVL pendant luminaire. Compliments pendant mounted OVL Luminaire. Housing constructed of durable, lightweight, extruded aluminum. Endcaps are made of die-cast aluminum for rigidity. 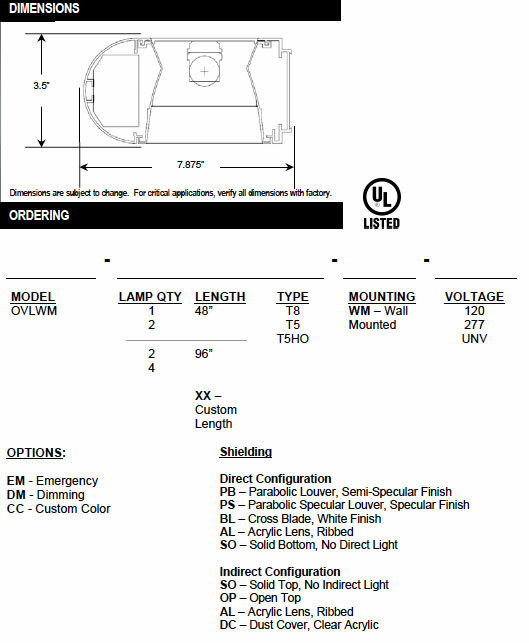 A wide variety of lamp shielding is available. You may request parabolic louvers or cross blades with any finish or acrylic lenses of any distribution pattern. Housings are post-painted in white as standard, with smooth polyester powder coat. Custom colors and textures are available upon request.